Atacs 4552: THERMOCOUPLE ASSEMBLY(SET/8 COLOR) « Atacs Products Inc. This assembly is a set of (8), J-type thermocouple wires (24 gauge, dual wire, kapton and color coated) with standard J-type plugs. This wire is the best compromise for conductivity and minimum mark-off. The kapton coating is an excellent surface treatment for a tight vacuum seal. 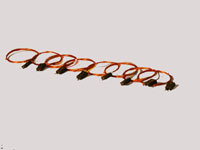 Each assembly has (8) separately colored wires for easy identification in lay-up. Color marker is not only at the jack but also recessed 20 inches from the welded end.